The weather is improving slowly but surely, and soon enough barbecue season will be upon us! Create the perfect garden oasis ready for those long evenings with family and friends. Our selection of outdoor furniture offers something for every garden! Our ‘Sheffield’ outdoor patio table is part of our bespoke table range – you can create a table to best suit your needs. 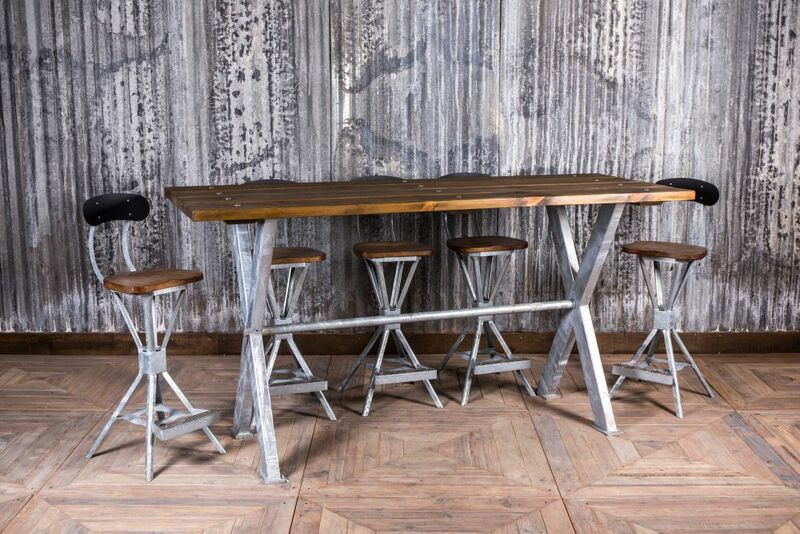 The X-frame base adds industrial style; its galvanised finish makes it ideal for outdoor use, and the pine table top features a protective oil to shield it from the elements. The outdoor ‘Sheffield’ table is available in a range of sizes with a round, square, or rectangular top. You can even have it at dining or poseur height, for something a bit more unusual. 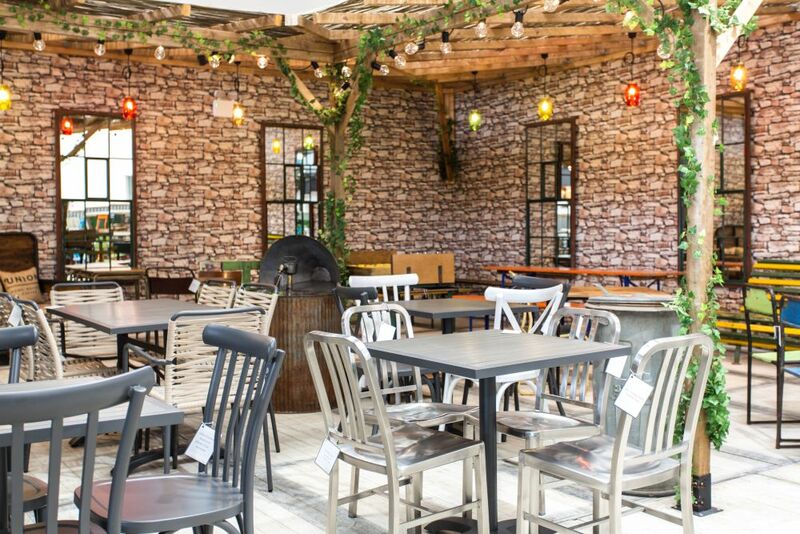 If you’re furnishing a beer garden, why not mix and match? Arrange a selection of tables of varying heights for an interesting aesthetic. X-frame ‘Sheffield’ stools are a fantastic pairing for the ‘Sheffield’ outdoor table; the stools can be galvanised for outdoor use. They have a modern industrial design, with the steel base, solid oak seat and curved backrest providing a quirky alternative to standard outdoor seating. After something simple and understated? Our ‘Hampton’ aluminium tables perfectly match the ‘Helmsley’ chairs, but also team well with the ‘Wightwick’ seating range. The grey frames of all three ranges give a modern and minimalist appearance which would suit any garden, and both the ‘Helmsley’ and ‘Wightwick’ chairs conveniently stack when they’re not in use. The ‘Wightwick’ range also includes matching bar stools, which would be ideal for pairing with the ‘Sheffield’ poseur table. For the ultimate in convenience, our vintage folding outdoor tables and chairs may be just what you need. The table tops are oiled, and the table base and chair frames are galvanised. As they are foldable, they can be easily stored in a shed or garage during the cooler months. Why not add vintage charm to your garden with a retro garden bench? We have two of these colourful vintage benches, one green and yellow and one pink and yellow. They are wonderful standout items that would certainly be a bright focal point. Whether you’re taking a break from gardening, topping up your tan or hosting an alfresco dinner party, sit in style this summer. Choose from our diverse collection of outdoor furniture! See our full collection of outdoor tables here, and outdoor seating here.